Summer is a perfect time to pack up your family for an afternoon picnic. Before setting off on your next adventure, make sure you know how to keep your family safe while you snack and play. With the following times, you’re sure to have a great time. Make sure you practice shopping cart safety when you visit the grocery store to stock up on delicious goodies for your picnic spread. With Safe-Strap’s retail products, you’ll be able to safely and conveniently shop with your children, regardless of their age. If you have an infant, look for carts equipped with Safe-Dock, which is designed to securely contain your infant carrier so you don’t need to disturb your little one when you arrive at the grocery store. If your children are a bit older, keep an eye out for shopping cart seat belts or our special Shop-Along carts, which can accommodate multiple children. It’s important to follow food safety guidelines to keep your family safe from food poisoning. Be sure to handle any raw meats with care, and bring extra plates to avoid cross-contamination. Pack your food in a well-insulated cooler to ensure it remains below 40 degrees Fahrenheit, and when you arrive at your destination, don’t leave food outside in the heat for longer than two hours (one hour if the temperature rises above 90 degrees!). Check out our last post for some grill safety guidelines, if you plan to barbeque on your picnic. Finally, wash up! Before you pack your picnic basket, wash your hands so you don’t spread any germs. If you handle uncooked meat, wash your hands again before readying the rest of your basket. Finally, if your picnic location doesn’t offer a restroom with a sink, bring moist towelettes or hand sanitizer to clean your hands and eating surface before digging in. 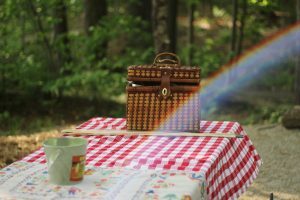 With these simple tips, you’ll be ready to enjoy a safe picnic with your family!